Saturday Ferry Reservations available ! This is a Saturday to Saturday only rental in the summer months. 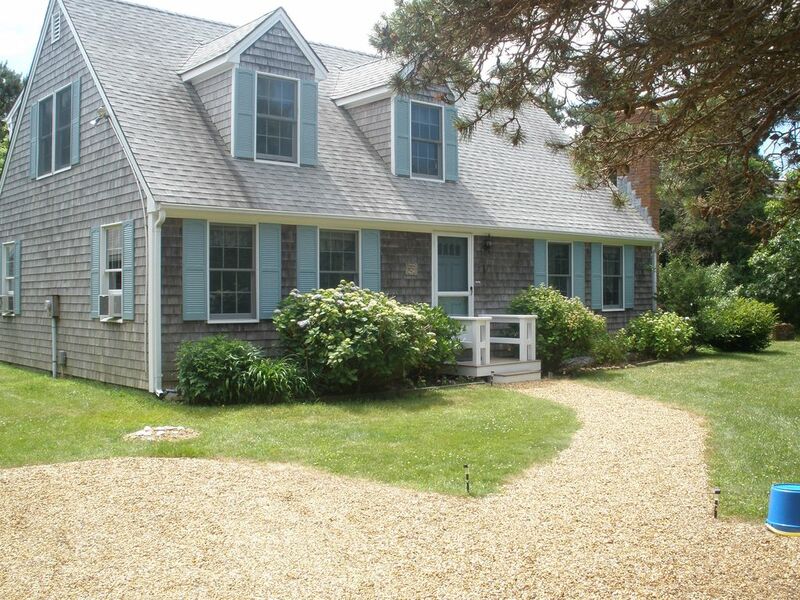 Enjoy your Martha's Vineyard vacation in this fabulous (super clean!) Cape Cod nestled in a quiet, secluded, family neighborhood, conveniently located in Katama between Edgartown and South Beach. The home is just minutes away from scenic bike paths leading to some on the island’s most spectacular beaches. It is a very pleasant 1.25 mile walk or bike ride into the center of town. First floor great room is bright, open and inviting. Features include airy cathedral ceiling, hardwood floor and classically charming New England decor. The great room has plenty of windows overlooking the lovely private yard and deck. The kitchen is fully equipped. Dining area comfortably seats 6 for a quick bite or leisurely meal. First floor has two cozy bedrooms each with its own window air conditioning unit for customized climate control. Upstairs a roomy,open loft awaits you, perfect for the kids or guests who desire a separate spot to relax and slumber. There is a spacious deck off the great room, ideal for breaks between sightseeing treks and al fresco dining. A large enclosed outside "after beach" shower available for your refreshment, after a full day of sun and surf. Beach chairs and children's sand toys also provided for your carefree enjoyment of the coast. All the amenities to make your vacation memorable are close at hand in this delightful seaside retreat. Beautiful sunsets, pristine beaches, top restaurants, unique boutiques, boating, biking, fishing, you name it, all nearby. Washer and Dryer for your laundry needs. You may also arrange linen rental through a local service. Please note that we have a separate garage/studio apartment on the grounds that may or may not be occupied by a family member. We inherited this home from our parents who built it in 1975. They built as their dream retirement home and lived in it year round for many years. The Kitts Field Circle location is ideal. It is very private, quiet, close to town, beaches, bike paths, tennis,town playground and Morning Glory Farm. While vacationing, you will really enjoy the privacy of our location and deck and its proximity to town. No other homes are visible from the deck. The large outdoor shower is wonderful and refreshing after a day at the beach. We have window AC units in each of the two downstairs bedrooms. Parking for cars in driveway. Wi Fi instructions posted in the home. Cable television service through Comcast. Board games in the closet. Some childrens VCR and DVD tapes in the home.